Join the YES Young Professionals Committee! The Young Professionals Committee at Youth Enrichment Services (YES) is a young professionals group dedicated to empowering urban youth in Boston through outdoor and enrichment programming. 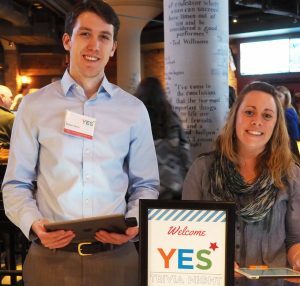 Members consist of motivated individuals in their 20s, 30s, and 40s who are willing to fundraise, promote, and raise awareness for YES’s mission. The committee provides young professionals in Boston the opportunity to network, volunteer, socialize, and give back. If you are interested in joining the Young Professionals Committee, which plans and executes 4 – 6 after-work events to benefit YES each year, read the requirements below and apply at the link below. Contact Meghan, Development Coordinator, at [email protected] with any questions. Financially support YES by giving or getting at least $250 annually through personal event attendance and/or attendance by members of your personal network. Attend at least 75% of committee-planned events and planning meetings throughout the year. Invite, host, and “close the deal” on event attendance by individuals in your personal network. Attend and support special events hosted by the committee. Generate attendance among your personal and professional network for special events. Build awareness and connections for YES in your personal and professional communities. Help plan and execute special events hosted by the committee. Communicate and promote YES’s mission and programs to your personal networks. Help develop new fundraising ideas and opportunities in partnership with YES staff.